By Hazem M. Matta, D.O., Meredith Watts, M.D., Alison Chetlen, D.O. A 42-year-old premenopausal woman presented for a baseline screening mammogram. She had no significant past medical history. Her social history revealed prior intravenous drug abuse, multiple sexual partners, treated sexually transmitted diseases, and multiple right upper extremity decorative tattoos obtained approximately 6 years prior to her presentation for screening mammography. She denied weight loss, foreign travel, fever, or night sweats. She denied inflammatory or skin diseases. She had no palpable axillary adenopathy on physical exam. 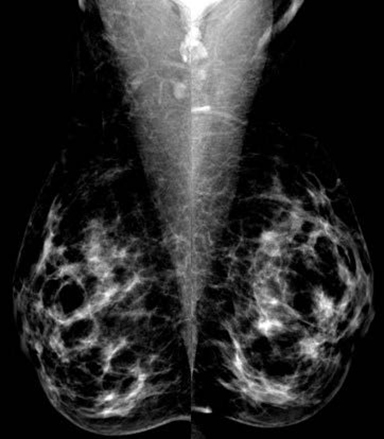 Her screening mammogram demonstrated radiopaque densities in the right axillary lymph node region, only seen on the MLO view (Fig. A). No other suspicious calcifications, masses or areas of architectural distortion were identified in either breast. The left axilla was unremarkable. Subsequent spot compression views of the bilateral axillae demonstrated the morphology of the intranodal radiodensities in the cortex of a single right axillary lymph node (Fig. B). The remaining lymph nodes were normal in appearance. 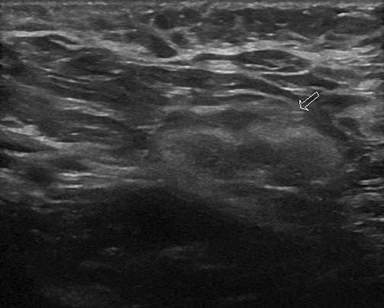 Ultrasound evaluation of the right axilla revealed a normal sized lymph node with normal morphology, preservation of the fatty hilum, and thin symmetric cortex (Fig. C). Subtle echogenic densities were seen within the cortex of this lymph node. Ultrasound-guided core needle biopsy was performed to exclude occult metastatic malignancy. A specimen radiograph (Fig. D) was immediately obtained to confirm the retrieval of the densities. The initial detection of intranodal axillary densities on a screening mammogram warrants further work up to exclude occult metastatic disease from mammary or extramammary malignancy, especially in the absence of a benign etiology. Intranodal coarse, dense calcifications are usually benign and are most often associated with granulomatous disease or fat necrosis. However, intranodal microcalcifications have been reported in a number of additional disease processes, both malignant and benign. Imaging features suggestive of metastatic disease within lymph nodes include loss of fatty hilum, loss of the reniform or oval shape, ill-defined margins, increase in size, or increase in density when compared to prior mammograms.6 In addition to the imaging characteristics, physical examination and clinical history may help guide appropriate work-up and management. 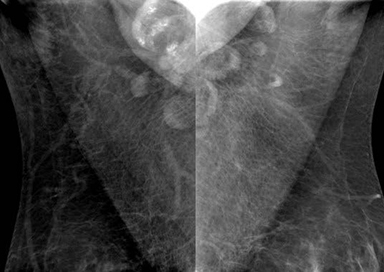 When intranodal calcific appearing densities are encountered on mammography, the radiologist should be aware of the differential diagnoses associated with such findings, including occult breast or extramammary malignancy. Closely examining the morphology and the distribution of the radiodensities may help in delineating benign from pathologic etiologies. Obtaining a past medical history and examining the patient for upper extremity, breast or shoulder tattoos will aid in narrowing the differential diagnoses; however, biopsy is often necessary to exclude malignancy given the overlap in mammographic and ultrasonographic appearance of normal and pathologic lymph nodes as well as the non-specific presentation of the tattoo pigment radiodensities. Chen SW, Bennett G, Price J. Axillary lymph node calcification due to metastatic papillary carcinoma. Aust Radiol 1998; 42: 241-243. Hooley R, Lee C, Tocino I, et al. Calcifications in axillary lymph nodes caused by fat necrosis. Am J Roentgenol 1996; 167: 627-628. Helvie MA, Rebner M, Sickles EA, et al. Calcifications in metastatic breast carcinoma in axillary lymph nodes. Am J Roentgenol 1988; 151: 921-922. Bruwer A, Nelson GW, Spark RP. 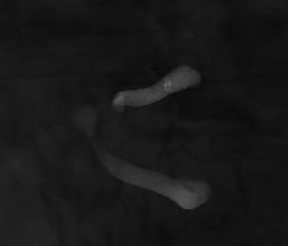 Punctate intranodal gold deposits simulating microcalcifications on mammograms. Radiology 1987; 163:, 87-88. Sieniewicz DJ, Nidecker AC. Conglomerate pulmonary disease: a form of talcosis in intravenous methadone abusers. Am J Roentgenol 1980; 135: 697-702. Cao MM, Hoyt AC, Bassett LW. Mammographic signs of systemic disease. RadioGraphics 2011; 31: 1085-1100. Sperry K. Tattoos and tattooing. Part II: Gross pathology, histopathology, medical complications, and applications. Am J Foren Med Path 1992; 13: 7-17. Timko AL, Miller CH, Johnson FB, et al. In vitro quantitative chemical analysis of tattoo pigments. Arch Derm 2001; 137: 143. Honegger MM, Hesseltine SM, J.D. Gross JD, et al. Tattoo pigment mimicking axillary lymph node calcifications on mammography. Am J Roentgenol 2004; 183: 831-832. McDermott A, O'Donoghue G, Kerin M. Reminder of important clinical lesson: tattoo pigment mimicking meastatic malignant melanoma in an axillary sentinel lymph node. BMJ Case Rep 2010 (doi: 10.1136/bcr.01.2010.2607). Matta HM, Watts M, Chetlen A. Radiopaque Densities Within Axillary Lymph Nodes. J Am Osteopath Coll Radiol. 2014;3(1):23-25. Hazem M. Matta, D.O., Meredith Watts, M.D., Alison Chetlen, D.O. Dr. Matta, Dr. Watts, and Dr. Chetlen work with the Department of Radiology, Penn State Milton S. Hershey Medical Center, Hershey, PA.